In this video, I show how I made the clay form for my dragon’s head. This might not be the best way to do it, since I’ll now have to create the armature for hte body the right size to fit the head. It did work though. 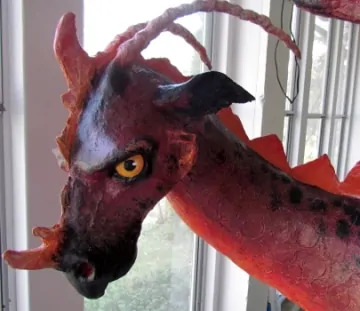 To be honest, though, this paper mache dragon took considerably longer than I thought it would, and it became way too heavy. You’ll see why as you watch more of the videos. Next video, I’ll add the plaster cloth and then remove the clay, leaving a hollow head. After that, I get to make a trip to the building supply store for some foam insulation board to use as the pattern for the body armature. This dragon is going to be a lot bigger than I intended. I guess that’s OK, as long as I don’t make him too big to go through doors! I am looking for some help with a giraffe head bust not long finished my baby elephant. Was my first attempt with paper mache. Have u any tutioral that might help. I added a picture of my elephant not sure if u received it. Thanks. Jessie, the elephant’s photo was not uploaded. You probably need to edit the photo and make it smaller. Please try again – we would love to see it. I do have a tutorial showing how I made my own giraffe. You can see it here. Hi Sharron. I’ve never used resin glue with the flour and water paste, so I don’t know what would happen. When I added Elmer’s glue to the flour and water paste, it didn’t make the bond any stronger. Dan Reeder uses fabric from an old bed sheet for his last layer – the skin – on his dragons, and he glues it on with diluted Elmer’s. If the resin glue mixes with water, that might be the way to go. You can see his book with his monsters and dragons here. The easiest way to get the proportion of the head the way you like it is to draw out several dragons, life-sized, on a big piece of paper. Dragons come in all shapes and sizes, so there’s no way to do it wrong – as long as you like the way it looks. Hello, I didn’t know where else to ask this question so I put it here! Roughly using your cat pattern I made the armature for my graduating daughters 8th grade pather mascot. I am ready to use your clay but wonder about the teeth? Any advise? I was thinking making them out of clay and hot glueing them but wanted advice from the expert! Thank you for doing such wonderful videos, Great explanations! I am writting you from Spain. I have discover you on YouTube and I am obsess!! You are great just not only with your hand but you explanations and videos are fun. I have some troubles following some of the material due to english but I think now that I have identify them all. One quesiton that I have regarding this dragon head. Why removing the clay for leaving a hollow head? It was too risky and extra work, and I wan’t to know why for my future projects. Hi Claudia. I removed the clay because it’s water-based clay, and it’s heavy. It’s only used as a mold for the paper mache or plaster cloth. It’s also possible to make a form using crumpled paper and masking tape, like I’ve done with most of my animal sculptures. If there’s no clay inside, the paper can be left in, and the head doesn’t have to be hollow. Your comment about not getting plaster on your camera sounded familiar to a personal photographic problem that I am trying to solve. I want to use my SLR camera to photograph a craft process which requires showing both of my hands. I need to trigger the exposure with a remote so I purchased a plug-in for the camera on a long cord and a switch on the other end. And now I am trying to develop a foot operated accessory switch to operate the hand held switch at the end of the remote cord. If your video camera could be operated with a foot switch you could eliminate having a second person turning the camera off and on. Would you mind telling me what equipment you are using because I really like your videos. Also: Are there DVDs available of each project so that I can take them to my studio and watch them instead of looking at my computer screen which is not available to me in the studio. Another reason for asking: I would like to know so that I can introduce your excellent teaching skills to an instructor I know that could use them in a student art class to teach an expanded class program in an existing art facility. Hi Gary. I would love to use a remote control thingy with my camera. I’m using a Canon PowerShot SX30 IS. It was recommended by David Lemon, who makes great videos of his Western-themed clay sculptures for YouTube. I have not made any DVDs of my videos, mostly because I wing it too often, and change my mind in the middle. Just like I’m doing with the dragon. However, you can get a free program for your computer that will allow you to download any video from YouTube and then save it to your own DVD. There’s an article about how to do it here. Speaking of David Lemon, I just found out that he’s making a DVD, not yet done, about how to sculpt a horse’s head. That’s one I have to get for my library. I hope he gets it done soon. Oh! It looks fantastic, Jonni! Sculpting with clay looks sooo much easier than sculpting with tape, newspaper and everything else minus the kitchen sink. Hope to some day soon make an investment in the clay and see just what I can accomplish with it. The dragon is wondrous! Another very well done project. Thanks for sharing. Cool! I particularly like his muzzle.